Jess first made her BBC Proms debut at the Royal Albert Hall 12 months ago and returned as part of the BBC Young Musician 40th Anniversary Prom in July. 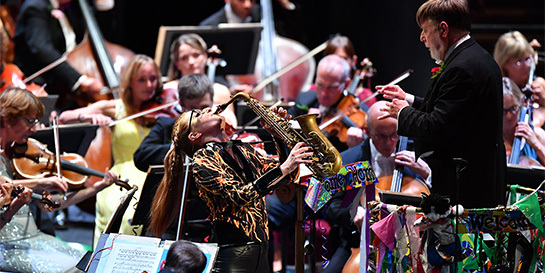 Last Saturday she played Michael Nyman's If (from The Diary of Anne Frank) at Proms in the Park in Hyde Park, before dashing to the Last Night of the Proms Royal Albert Hall for a spritely performance of Scaramouche, bringing the audience to their feet. Jess released the two tracks, her debut recordings, the day before to coincide with the big events. Decca lined up a lively socials plan for the day in collaboration with the Royal Albert Hall and BBC Proms. Jess took over the Royal Albert Hall Instagram account and posted her journey to the venue on her personal IGTV. The team also captured a behind-the-scenes time-lapse of Jess’ journey from the stage at Proms in the Park to the stage at the Last Night of the Proms. Jess’s solo performance has been widely praised by Proms viewers and press, further boosting her profile beyond her burgeoning concert career. Jess often appears extensively in recital throughout the UK and performs with orchestras including the BBC Philharmonic, BBC Concert Orchestra, Royal Northern Sinfonia and Manchester Camerata. Jess became the first sax player to be signed to Decca Classics after catching the public’s eye during BBC Young Musician 2016.. In June, she made her international debut with the Swedish Gothenburg Symphony Orchestra and upcoming appearances include concerts with the L’Auditori Barcelona (Spain), Argovia Philharmonic (Switzerland) and a recital at the acclaimed Philip’s Collection series in Washington DC. Hooked on saxophone from a young age, Jess is keen to give people from all backgrounds access to classical music and has set up her own concert series in Ulverston, bringing world-renowned musicians from across the world to her hometown. She is a champion of new music for saxophone and there will be a number of new commissions written for her over the coming years.